Stunning news that Japanese climber Nobukazu Kuriki was found dead at Camp 2 on the Nepal side of Everest on the Standard route. The Himalayan Times reports that Sherpas found him at C2. I had just reported that he was feeling better after a cough and was prepared to go higher on an unspecified route. He had struggled in 2018 with a high fever and a cough. Personally, I am shocked as I always found his climbs inspirational. 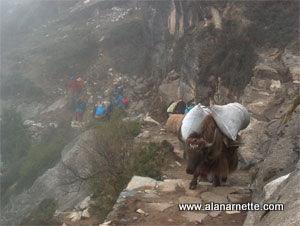 Update: Its now being reported that he reached C3 on the Lhotse Face and began to have problems with coughing and pain. Intermittent radio contact prevented searchers from finding him and he was missing around 11:30 pm. His body was finally found above Camp 2 in the morning. Kuriki-san was an alpinist purist – always alone, no supplemental oxygen and in the off seasons. He set a standard for his climbs that seemed impossible even for himself. Only a few teams attempt Everest in the autumn season each year due to shortening, cold days and the quickly approaching winter snows. But his determination and commitment was impressive regardless of the results. Climbing alone was his “style” of climbing. He had solo climbs of McKinley (2004), Aconcagua, Elbrus, Kilimanjaro all in 2005 and Carstensz Pyramid in 2006. This was his eighth attempt on Everest and 13th on an 8000 meter peak, all without supplemental oxygen. Kuriji-san had become a legend in Japan with his Everest attempts and going so far as to lose his fingers to frostbite. He dreamed of summiting Everest in the autumn – rarely accomplished by any climber – in his unique style of strictly alone and without supplemental oxygen. This was his dream and he never let it go. Nobukazu Kuriki was quite the showman with videos produced during his climbs and slide shows after. He was a popular public speaker in Japan. His followers measured in the millions but even with that he had to hustle each year to find sponsors for his next climb. His previous attempts have been met with drama and injury. In 2012 he attempted the West Ridge and had to be rescued by a Sherpa team. He lost nine fingers on on that thwarted attempt. In 2015, he reached a bit above the South Col before deep snow forced him to stop.nIn autumn 2016 from the Tibet side, he planned on the North Face then to the Hornbein Couloir but was turned back by poor conditions. He usually brought a large film crew along to document his experience, primarily for the Japanese market. They usually post excellent photos of his experience on his social media.Kuriki’s team posted this amazing video on him somewhere on the North Face – beyond amazing!!! Thank you Kuriki-san for your courage, vision, determination and strength. Your showmanship to share your dreams brought millions into a word they otherwise would have missed. Thank you for being a true alpinist. Rest in peace in your mountains.